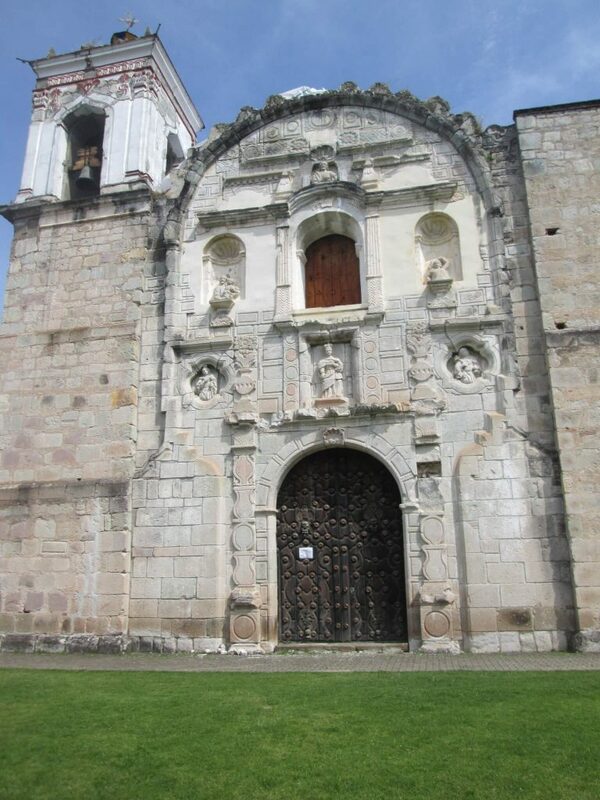 Walking in Oaxaca and the Villages of Mancomunados - Come adventure with me. The best part of the trip is the journey. 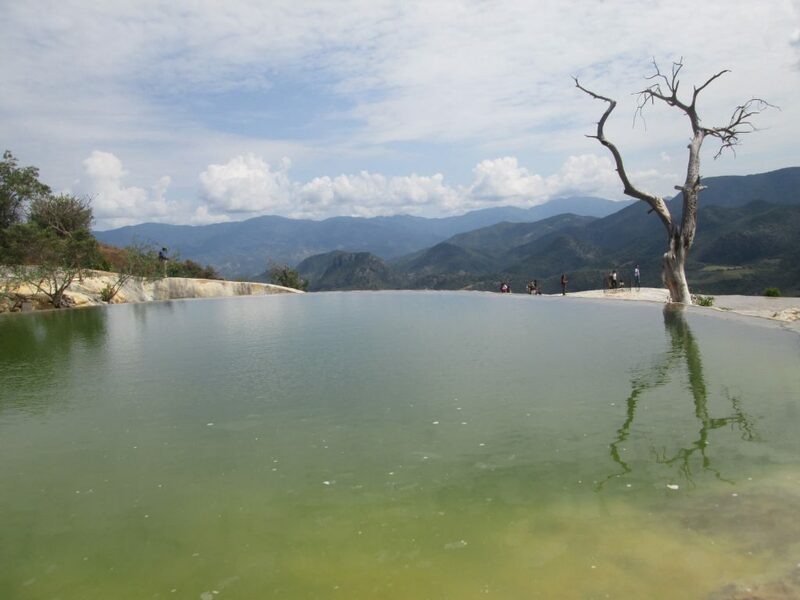 On our Oaxaca trip, a 12-day trekking adventure in the Sierra Madre mountains south of Mexico City, change was constant and brought us opportunities that our original itinerary never would have provided. Thank heavens a great outfitter, super personalities, and a playground full of hiking options joined us on our hiking adventure. 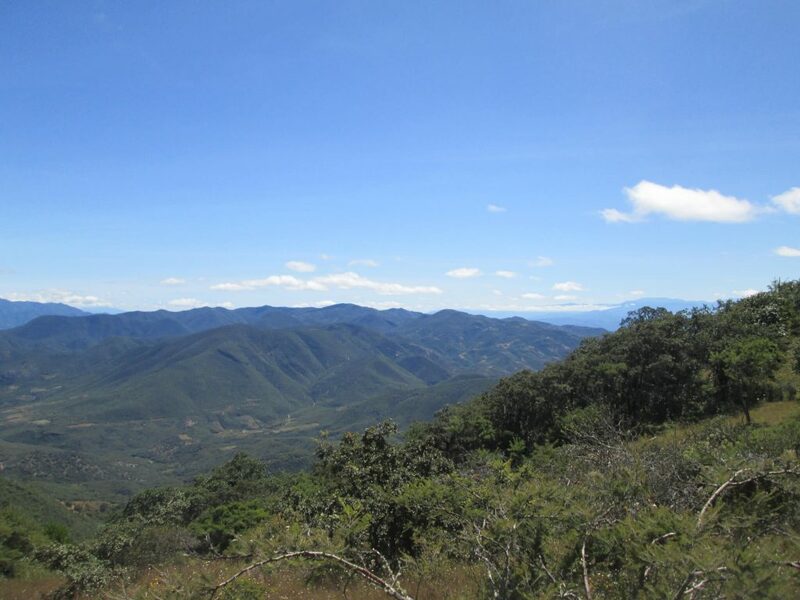 Our original Oaxacan itinerary had us hiking for almost a week in the Mancomunados area of the Sierra Madres. 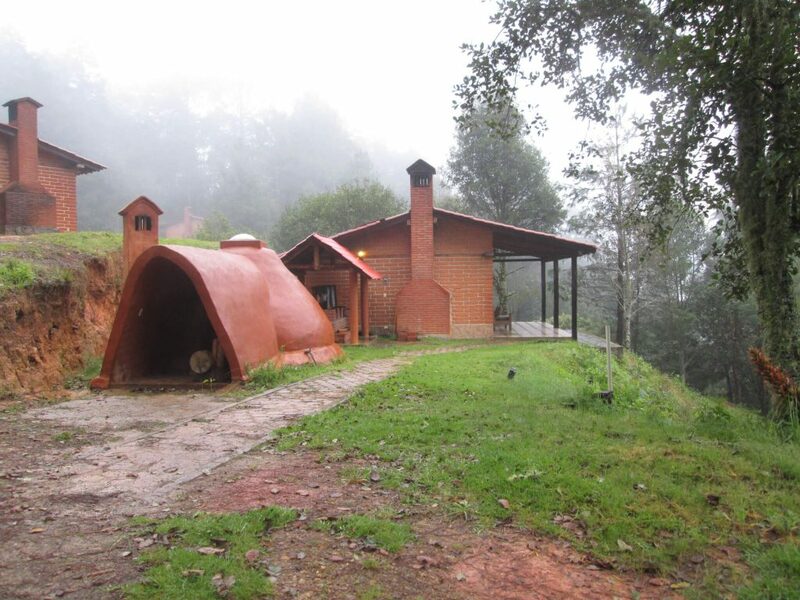 The Mancomunados is a ecotourism coop of seven Zapotec villages within the Sierra Madres. The villagers formed a relationship to promote ecotourism, rather than the destruction of their forest, and they provide a sustainable adventure for folks looking to get off the beaten track. Each unique village has cabanas and a common kitchen (a comedor) where the locals cook meals for visitors. To get from village to village, tourists can ride bikes or hike with the aid of local village guides. Thus, our itinerary would take us from village to village, staying nightly in the cabanas and eating the local food in the comedors. 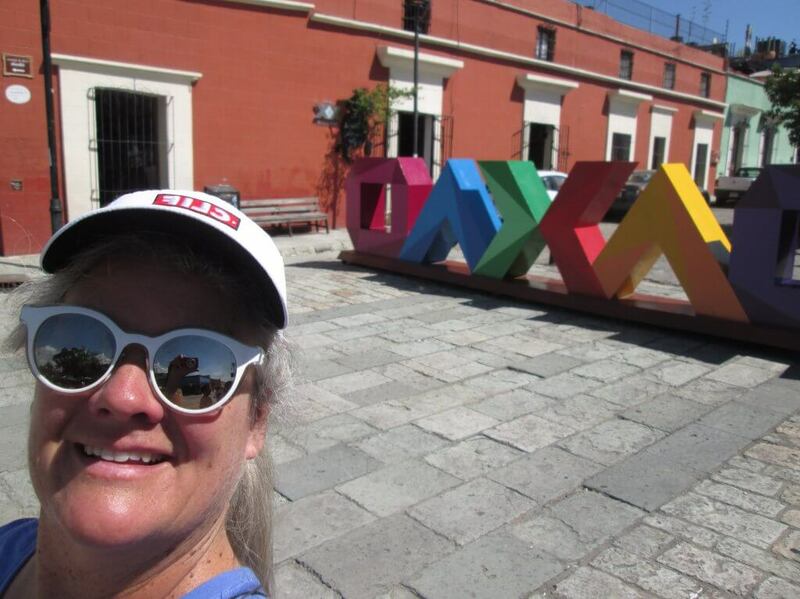 We landed in Oaxaca, grabbed a collectivo taxi (stand in line at the airport and get your taxi ticket), met our outfitter (Pedro from Bicicletas Pedro Martinez), and checked into our hotel at the Villa Vazari, conveniently located right across from our outfitter. The next day, Pedro loaded us up in is van and off we went to Monte Alban. 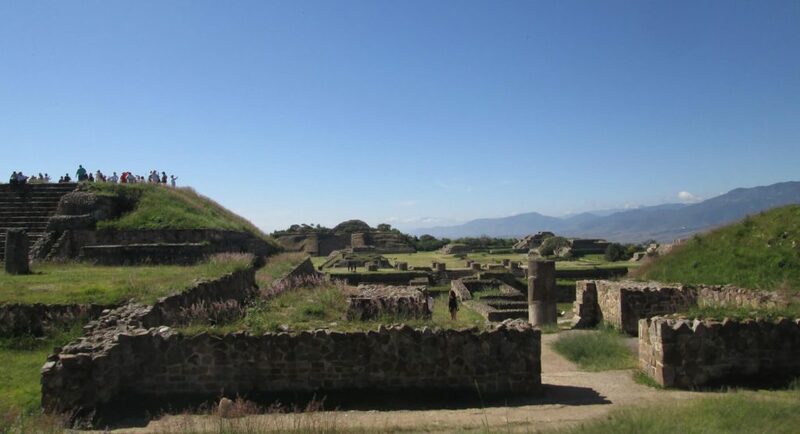 Monte Alban is the Zapotec’s version of Machu Picchu. Excavated only 10% currently, archeologists expect it to be larger than Machu Picchu. Our local guide Gabriel took us around the site, pointing out the two ball courts built into the city. 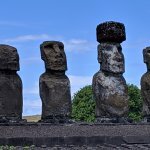 Games would go on for weeks–the first time the ball touched the ground, a winner was declared and sacrificed to the gods! 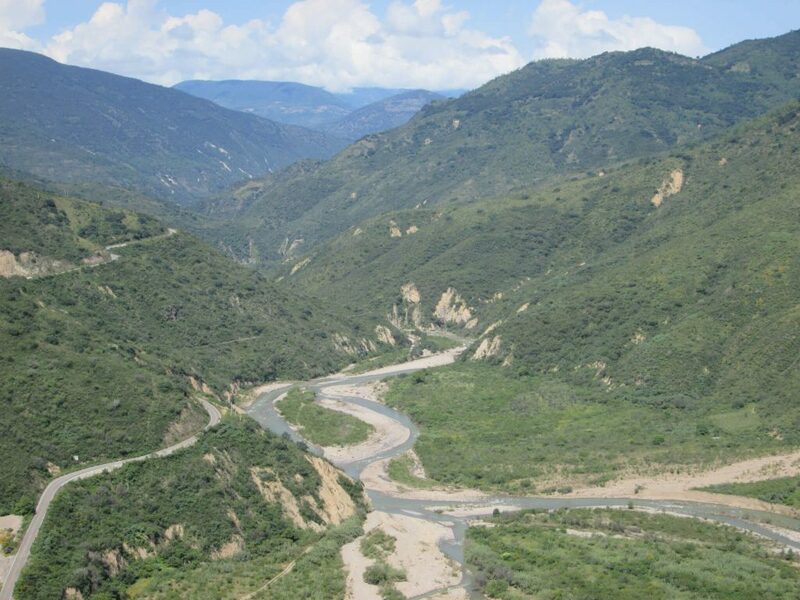 Meandering through the site provided great views of the Oaxacan valley under sunny 73 degree skies. Our next stop on our first day was an alebrijes factory. The first person to take the original paper-maiche creatures and turn them into wooden toys was Manual Jimenez. We stopped at his factory, and met his son, who is now creating a museum in honor of his father. Junior demonstrated how to make the alebrijes emphasizing the importance of movement and color in the design. 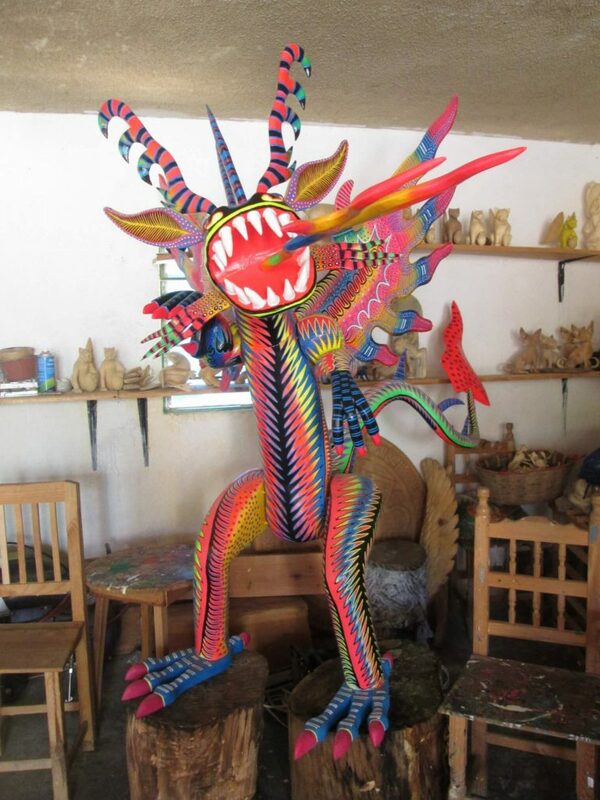 Although you can find alebrijes all over Oaxaca, the ones here at this studio are collectible, signed, and gorgeous. Don’t tell my family, but I bought a few for Christmas gifts! To see video of how Alebrijes are made, check out my YouTube Channel. We finished our first day at the award-winning Los Danzantes for dinner. I tried my best to spend my budget–$17–and could barely walk out of the restaurant when I had finished. Starting with a Spinach salad that had nopales, beets, goat cheese and pumpkin seeds, I followed that with a squash blossom and octopus pasta. The freshness made the flavors pop, barely leaving room for a creamy mezcal-laced flan for dessert. Thank goodness the hiking started the next day because we had some calories to burn! We loaded up the van, said good-bye to Oaxaca and headed up the mountains to hike in the cloud forest towards La Neveria. Twisting up the mountain, the sun gave way to clouds. 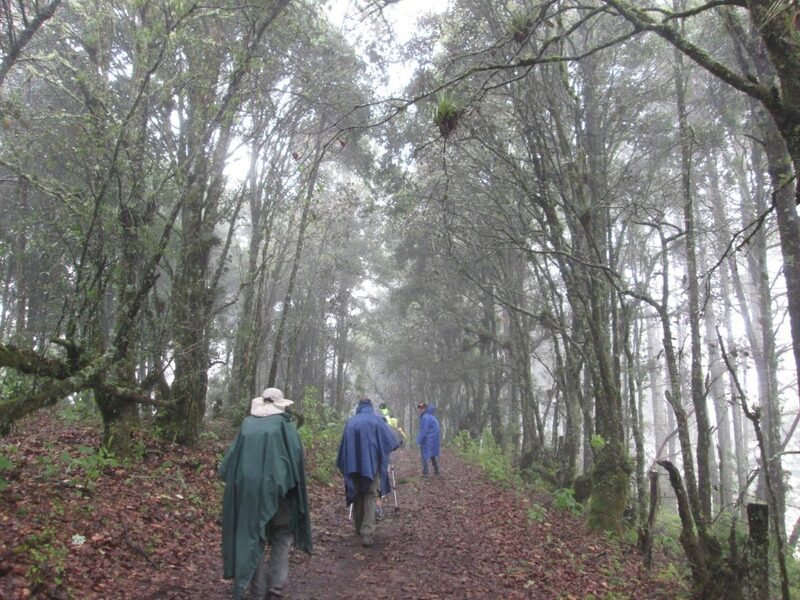 Pedro, along with his nephew Mario and our Mancomunados guide, Celestino, guided us on our first hike of clouds, pines, oaks, and bromeliads. 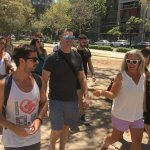 The clouds’ wetness provided wonderful filter from the sun, our spirits were high, and we arrived at La Neveria in no time. 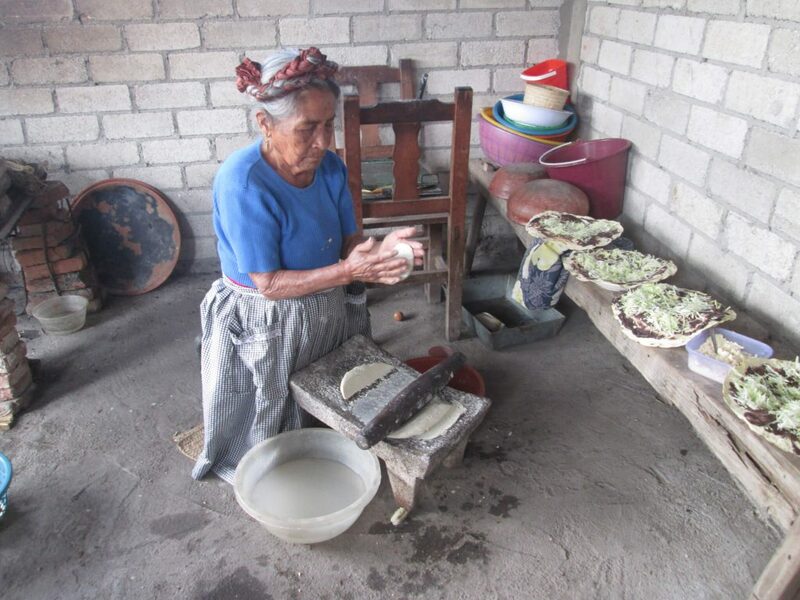 A typical comedor–the ladies cook on an open fire and a comal. It’s important to remember that eating in a comedor is rustic. The villages eat authentic, rural food. Tortillas, Oaxacan cheese, black beans and avocado, in as many combinations as you can imagine, make up the majority of the meals. Breakfast included eggs; dinner sometimes had chicken or ribs. The ladies in our first comedor fixed us quesadillas and black beans for lunch along with hot chocolate, tea and coffee. From the homemade tortillas to the frothy hot chocolate, our full bellies smiled. Off to the cabanas, the locals built us fires in our rooms as we warmed up. A few hours later, a lovely dinner of squash blossom quesadillas satisfied us for a night of sleeping with many blankets on comfortable beds. The next morning, we awoke to rainy and cold skies. After a chat with Pedro and Celestino, we changed our itinerary for better hiking conditions and headed toward Cuajimoloyas. Bundling into our best Colorado gear, we headed out into nasty, rainy conditions. Even still, the forests wowed us with their variety. Celestino shared his knowledge of the different types of agave, the hundreds of salvia, and the endless wildflowers in bloom. We couldn’t get far without picture taking. But the wind started to blow. At lunchtime, we discovered that Tropical Cyclone 18 had formed on top of us–a rare and unusual event that had never happened before. Climate change is real! With 60 mph gusts forcing us off the mountain, we headed to our cabanas in Cuajimoloyas for the night. Cold, wet, miserable. The fires in the fireplaces couldn’t burn hot enough, and we were all soaked to the bone, despite good quality gear. A chat with the group and Pedro was in order. After a cold night, we changed plans, never making it to Latuvi. Down the mountain we flew to sun and warmth! Leaving 10000 feet and approaching 6000 at the central valley, we found the valley of the sun. Peeling off coats and pants, our legs bared themselves in shorts as we walked through our third ecosystem, the desert valley. 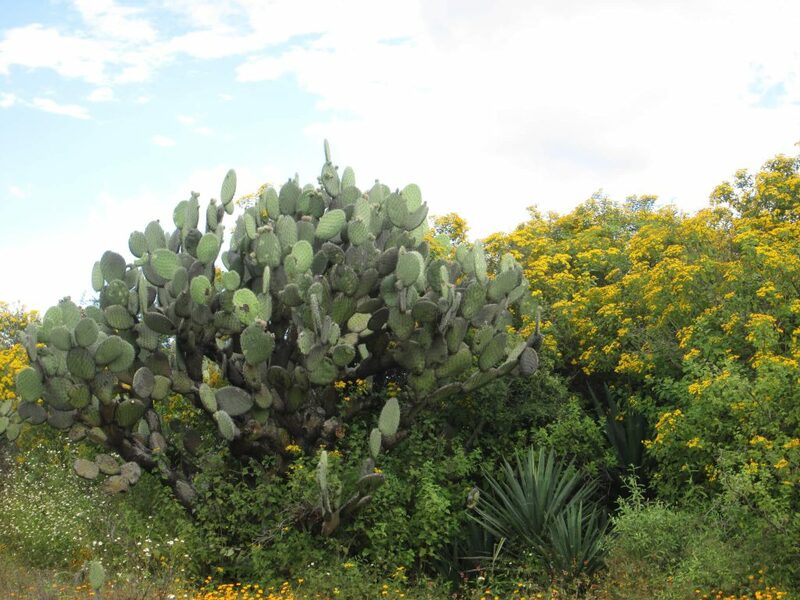 Celestino spouted off the cacti names, and we meandered along a dirt road through local villages. 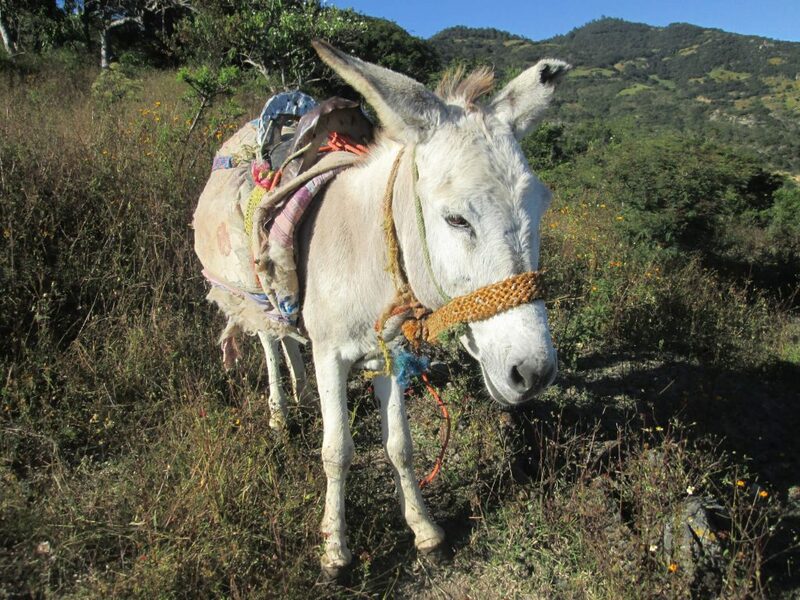 Local farmers tended corn and agave while cowboys moved cattle, sheep and donkeys. “Buenos Dias!” greetings welcomed us through town as we made our way to a carpet factory. 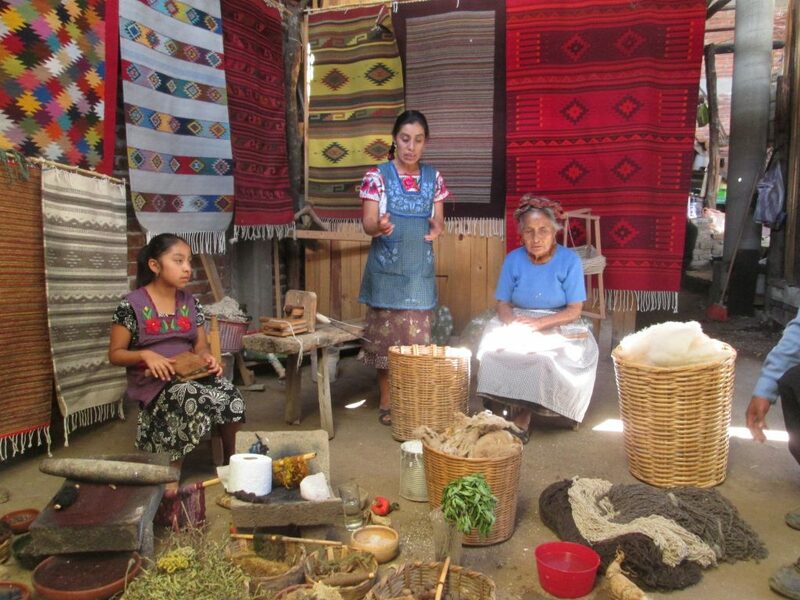 Arriving at the carpet factory, our carpet makers turned into tortilla experts and taught us how to make tortillas. From boiled corn to lye baths, a masa results. The abuelita of the kitchen handed us balls of dough to fashion into 6-inch round tortillas. We ended up with ovals, squares, rectangles and octagons! Placing them on the comal was an art in itself, as we burned the tips of our fingers. None the less, the freshly-made masterpieces tasted amazing, like nothing sold in the US for sure! Sitting down to a lunch of tortillas, salad, and chicken filled our bellies. Afterward, we learned how wool is gathered and spun, dyes are created, and rugs woven. A family affair! To see how the colors for the rugs are curated, watch my YouTube videos. Our day ended back in Oaxaca to start again the next day with a drive to the mountains. The tropical storm blew away and sunny skies welcomed us back. We headed up the mountain to cross and then descend to Hierve el Agua. After a good hike up the mountain and a stop for a break and a snack, we began our descent. Sadly, we didn’t make it to Hierve el Agua on that day. One of our hikers fell and broke her femur. In the middle of nowhere, exactly halfway between here and there, we activated our wilderness first aid skills. Fortunately, Celestino’s cell phone worked, and he called Pedro to cobble together a rescue team. No helicopters were available. 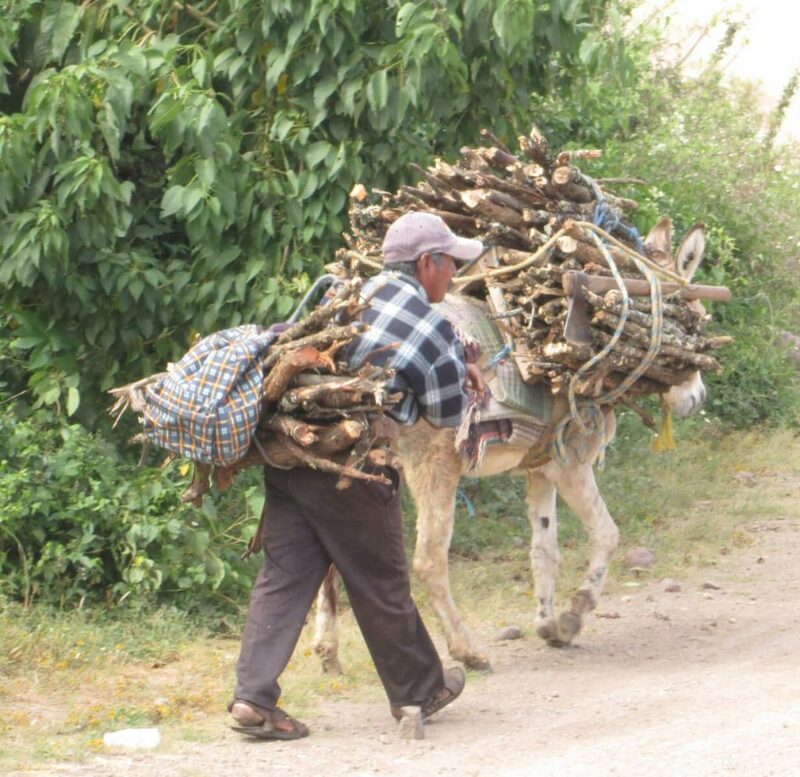 One donkey. Seven strong men. 20 quesadillas. One very calm patient. Three Mexican Red Cross rescuers. One ambulance. Seven hours later, we had our injured hiker ensconced in Oaxaca’s best hospital (named “2002”) and scheduled for surgery. 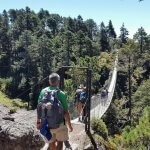 Need less to say, our next day became a rest day in Oaxaca as we took care of our hiker and again changed our itinerary. Coming into our fifth day of hiking, we said good-bye to our hospitalized friend who was in great care, and went back up to the mountains and into the Mancomunados area. 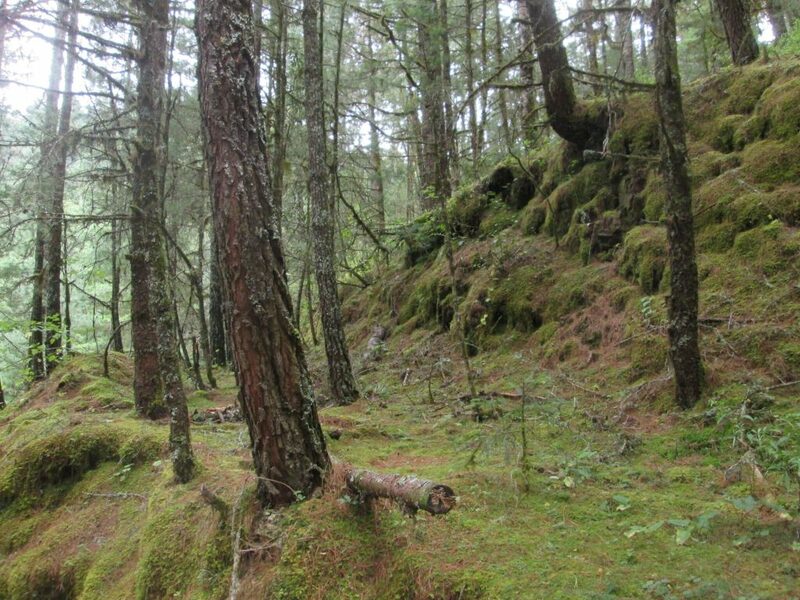 We had a gorgeous hike through a pine forest. Serpentine cacti grew on oak trees, surrounded by Spanish moss. 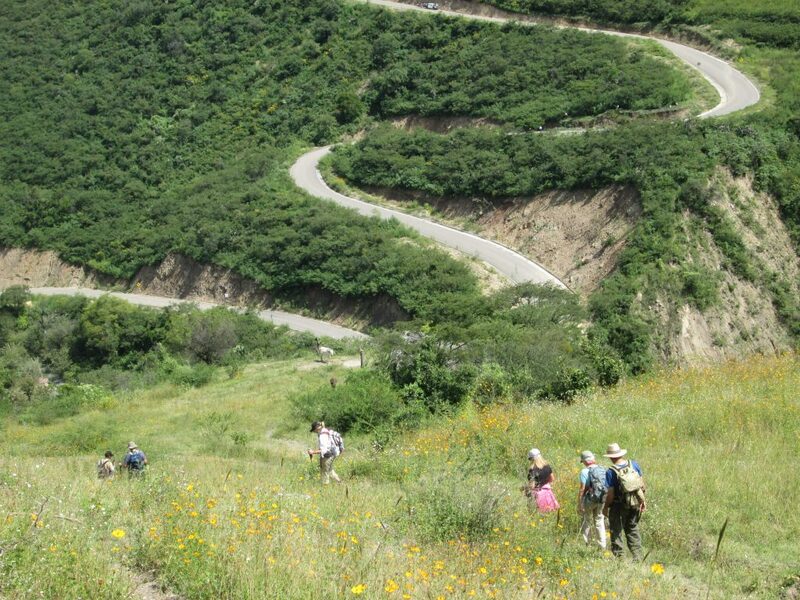 Thousands of wildflowers and hundreds of butterflies opened themselves to the sun as we made our way along the Cabeza de Vaca (cowhead trail) trail to Cabañas Ixtepeji. 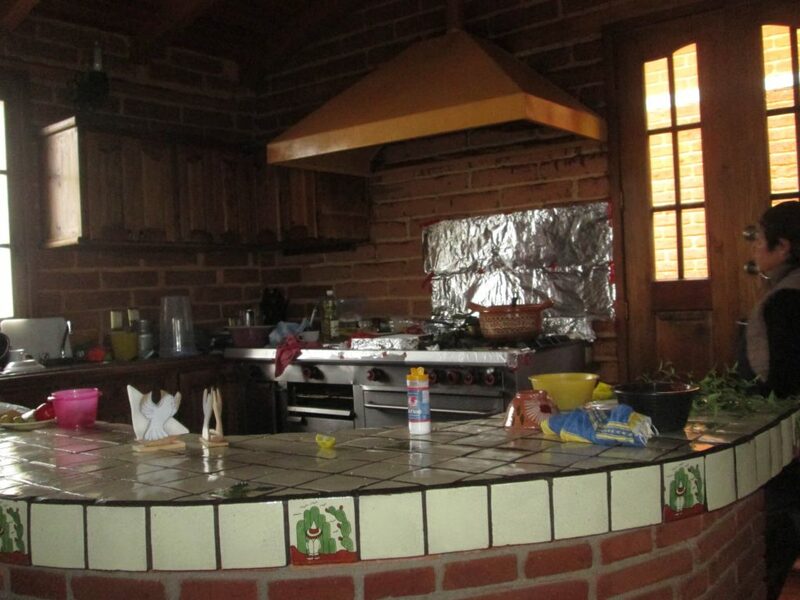 Another night of cabins, fireplaces, and tortillas, preceded the local mezcal which appeared out of no where! 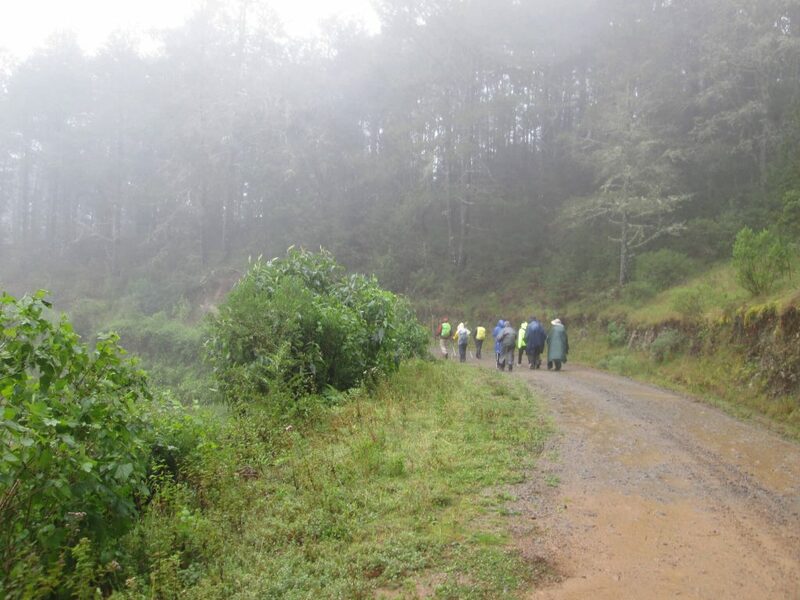 The next day continued our glorious hiking into Lachatao, home to some of the best food and cabins of the trip. But first we had to cross a river–and couldn’t due to its swelling from the tropical storm. So, we took the long way, clocking in our longest hike of just over 13 km. Lachatao, this wonderful little town, the biggest of the Mancomunidades, homed a 400 year old church, cabins with homemade soap and shampoo, and a basketball court of fun! Here, we had many discussions with our outfitter as we digested the impact of the rescue incident. Realizing the political and social capital that our outfitter had spent and our eagerness to express gratitude to the rescuers, we decided our last day of hiking would be a thanking mission back to Hierve el Agua’s community of San Ysidro. Thus, in the last of our itinerary changes, we headed to San Ysidro to have breakfast with the rescuers and to share school supplies, soccer balls, and office paper. I did my best to relay in Spanish our honor and graciousness for their help, saying from one mountain community to another, we are friends and neighbors. No one corrected my Spanish, so I think I got the right message out. From there, we all hiked the short distance to the Hierve el Agua, stopped by a mezcal factory, saw the Tulu tree, and then finished in Oaxaca for the day. 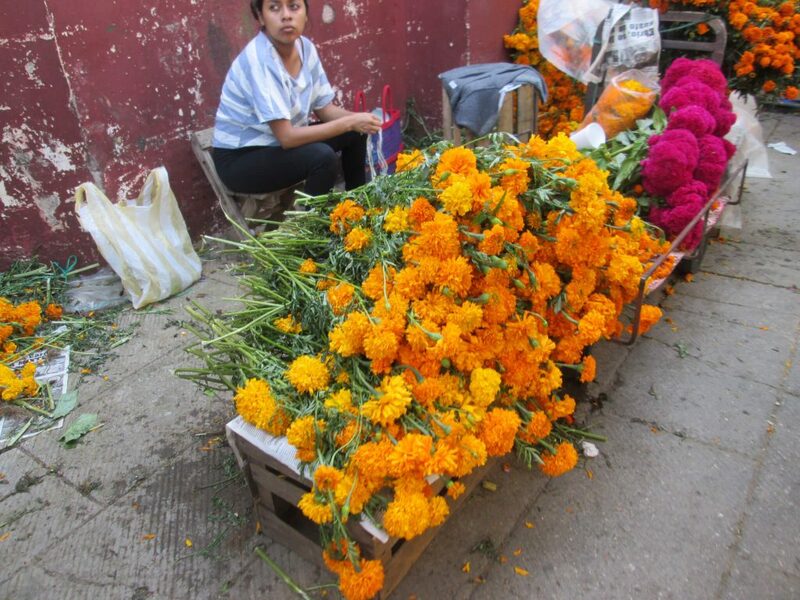 When we returned to Oaxaca, the Dia de Los Muertos festivities were in full swing! Flowers, incense, and dancing parties swooshed through the streets. Mexican and American tourists alike packed every nook and cranny, getting in on the celebrations. After dinner at La Casa de La Abuela (I had the stuffed zucchini blossoms again! 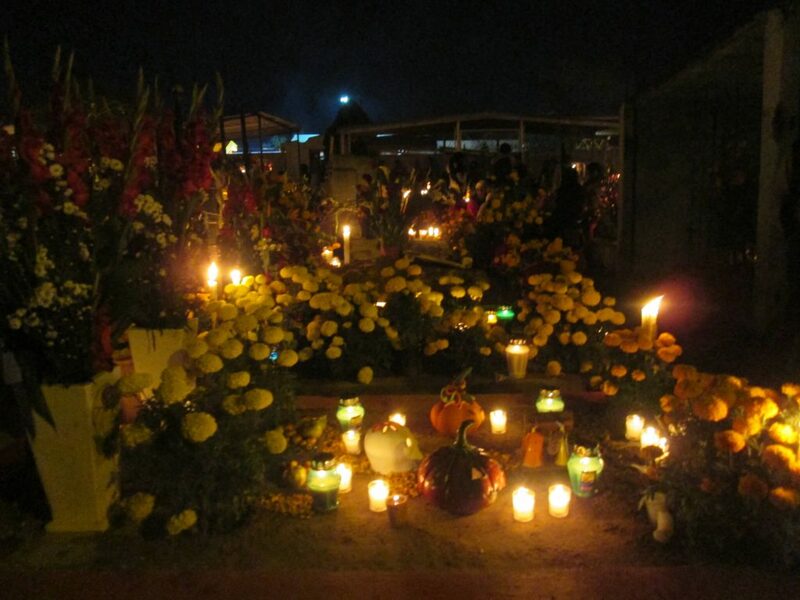 ), we ended up taking a tour to the largest and oldest cemetery, Xoxocotlan. We danced with the locals, celebrated their dead, drank mezcal, and embedded in the night’s festivities. We finished the night with warm Mexican hot chocolate and Muertos bread. Thus, our trip ended in Oaxaca. Dramatic? yes. Adventurous? yes. Awful weather? yes. Great weather? yes. Would I do it again? in a heartbeat. And we are…email me for details. We go every year during the last two weeks of October. By the way, if you’d like to read about our Oaxaca trip from 2018, read here.